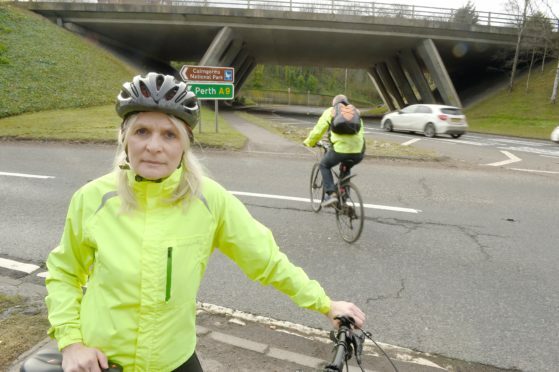 Inverness cyclist Susan Mccreadie at the Raigmore Interchange pedestrian crossing where a pedestrian was seriously injured in a collision with a car earlier this week. Serious safety concerns have been raised over a perilous Inverness crossing after a female pedestrian was struck by a car. The 57-year-old woman was crossing the A9 southbound slip road at Raigmore Interchange on Wednesday when a Mazda 6 car careered into her, leaving her battling serious injuries in hospital. She was originally taken to Raigmore Hospital for treatment. However, it is understood she has since been transferred to Aberdeen Royal Infirmary. In the wake of the incident, calls are now being made for urgent changes to help make the route pedestrian-friendly. Susan Mccreadie, 55, from Inverness, raised concerns with Councillor Isabelle MacKenzie last July following fears for her own safety. She said: “Inverness has many good walking/cycling paths; however, when you reach this slip road you are basically taking a chance crossing the road. Going towards the Retail Park, you have a good view of what is coming; however, many cars fail to indicate that they are turning off onto the A9 southbound. When coming from the retail park to town, it can be quite precarious, as especially in the summer you have a blind spot and cannot see whether cars approaching from the retail park are going straight ahead or turning in your direction. Road safety campaigner MSP David Stewart said residents are simply “gambling with their lives”. Multiple police units closed the carriageway for more than five hours as officers began conducting thorough investigations. Councillor MacKenzie added: “I am deeply concerned that this accident has occurred, as it has been mentioned before to me about this area and I did make initial inquiries. I will be looking for action to be taken now.